Milestones (more info, 1109 Hamilton Street, 604-684-9111) is a trendy chain restaurant which offers a selection of westcoast and American cuisine. The downtown Vancouver Yaletown location has been recently renovated in a post-modern/minimalist style with exposed wooden ceiling beams, halogen spot lighting, comfortable cushion booth seating, a brand new sound system and wide screen televisions. Price for entrees lies in the $15 to 20 range, and the restaurant also has an extensive drink menu. Service is generally excellent: the staff are personable and attentive. 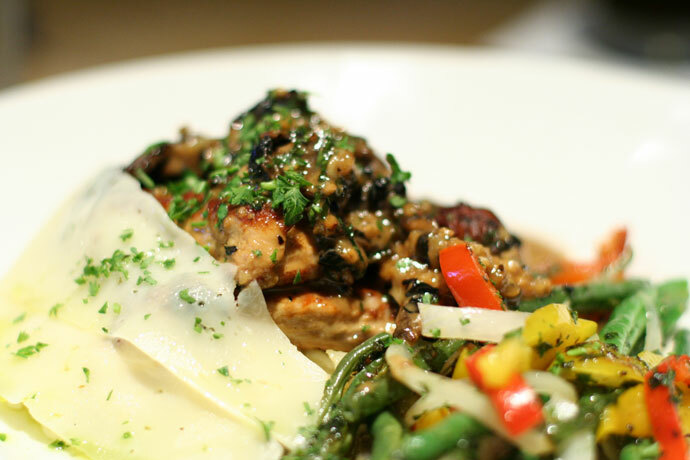 I ordered the Portobello Mushroom Chicken which was an inventive dish (pictured below, $16.95) that featured chopped portobello mushrooms with chicken cooked in olive oil served over a capellini pasta. 10,163 views. This entry was posted on Saturday, October 13th, 2007 at 1:03 am	and is filed under American, Casual, Chain Restaurants, Downtown, Food Photos, Fun atmosphere, Hamburgers, Italian, Large Groups, Lunch, Modern Decor, New Restaurants, Pasta, Patio, Restaurant, Trendy, Vancouver, Vancouver Restaurants, Yaletown. You can follow any responses to this entry through the RSS 2.0 feed. You can leave a response, or trackback from your own site.